There are two common types of heel pain. One is at the sole of the foot, at the heel (Plantar Heel Pain) and the other is at the Achilles tendon (Posterior Heel Pain). What is Plantar Heel Pain? “Plantar” refers to the sole and the plantar heel pain is most commonly felt at the heel area. The most common condition here is Plantar Fasciitis. It is commonly also called Heel Spur Syndrome because of the presence of a bony spur forming at this area. What is the Cause of the Plantar Heel Pain? Typically the pain begins spontaneously with no apparent injury, but it is often related to prolonged walking and standing. The pain is worse in the mornings when first stepping on the floor. In the early stages, the pain eases off after some time. The condition is more common in those who are overweight or spend a lot of time on their feet. It is also more common in those with flat feet as well as those with high arches. It can also be associated with gout or inflammatory arthritis – for example in Ankylosis Spondylitis (AS). Other conditions that can cause heel pain need to be excluded. These include stress fractures of the heel bone, and nerve problems such as Tarsal Tunnel Syndrome. In the latter, the heel pain is due to a pinched nerve along the inside of the ankle. What are the Treatments for Plantar Heel Pain? In plantar fasciitis, the first line of treatment is to reduce weight bearing activity, and use some form of cushioning in the shoes. In most cases with a flat foot or high arch, stretching the Achilles tendon is also very important. An X-ray can be done to exclude other conditions like a stress fracture. Thus, simple removal of this spur does not cure the problem. Further treatment may include anti-inflammatory injections. Extra Corporeal Shockwave Therapy (similar to the technology used in blasting kidney stones) and surgery. What is Posterior Heel Pain? Achilles problems are common in the more active, particularly those involved in running and jumping sports. “Quite commonly, the underlying problem is a tight calf”. Another aggravating factor is a high arched foot, in which the back of the heel bone may be protruding into the tendon insertion. 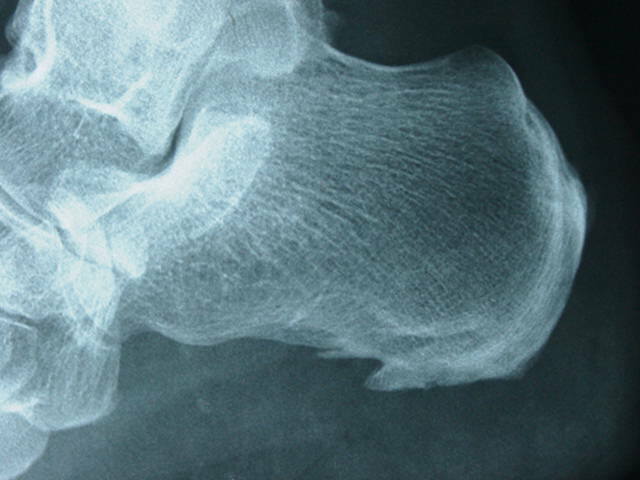 Some may also have prominence of the heel bone (Haglund’s Deformity) which also protrudes into the tendon. What are the Treatments for Posterior Heel Pain? Non-operative options are mainly a stretching, physiotherapy, reduced activity similar to many other overuse injuries. A small heel raise may also help reduce tension in the tendon. Radiological Imaging (Ultrasound or MRI) may be needed to look for degenerate tears. As with plantar fasciits, Shockwave Therapy can also be used. Surgical options range from Endoscopic Excision of prominent bone (Haglund’s Deformity) which is a simple day surgery keyhole type procedure, to various tendon transfers, and calf lengthening which require open surgery. Call +65 64712 674 (24 Hour) to make an appointment to see our doctor regarding chronic heel pain today.